What Does a Cruciate Ligament Operation Involve? Home > Types of Surgery > What Does a Cruciate Ligament Operation Involve? Most people will be aware of what a cruciate ligament operation entails through watching or playing sport. It is an operation on the knee and whilst the surgery is usually routine, it is one of the most serious to have to undergo for any sportsperson. There are two cruciate ligaments, the anterior and the posterior but the one most commonly damaged in sport is the anterior cruciate ligament although you do not have to play sport to require this operation. A simple, awkward trip where you fall and twist your knee severely might be sufficient to rupture your anterior cruciate ligament. If a full reconstruction of your anterior cruciate is needed, the procedure usually involves using a couple of hamstring tendons as replacements for the damaged ligament which are taken from behind the knee although, where that’s not suitable, a tendon from just below the knee cap might be used instead or, in some cases, even from your other leg. The operation is predominantly carried out under general anaesthetic and takes about one to one and a half hours. However, in some cases, a patient can receive a spinal anaesthetic, which just makes you completely numb from your legs downwards. These days the operation is carried out using keyhole surgery known as an ‘arthroscopy’ and the surgeon will use this method to fasten the replacement tendons into the knee to form the new ligament which will be placed exactly where the damaged one was. If you have any tearing of the cartilage, this will be repaired at the same time. Because of the keyhole procedure these days, although you’re likely to experience some pain and discomfort following the operation, it is usually controllable with painkillers and the majority of people are able to leave hospital the following day after an overnight stay. 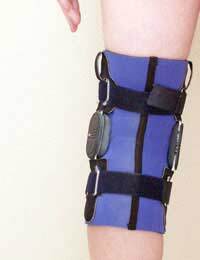 You might have a splint put on your leg to keep it straight and you’ll also be given a full briefing by your physiotherapist about rehabilitation exercises that will be required which will usually start off gently as soon as your splint is removed which might be only a week after the operation. Initially, you’ll be required to go back for regular checkups with your physiotherapist, perhaps for the first few months so that they can see how you’re progressing but much of the rehabilitation work will be done by you at home and, as time goes by, the degree of intensity can increase. In the early stages, swimming or cycling (or using a gym bike) is likely to be recommended but as your knee regains strength, you’ll also be able to do some light jogging where your knee has to bear the impact force of landing on solid ground. However, it is important to follow the advice of your physiotherapist as it can be just as damaging to try to do too much too soon as it is to do nothing at all, especially within the first few months whilst the new ligament is still knitting into place. You’ll also need to be careful about when you start driving again. Some people find they can drive within a few weeks but it’s usually recommended that you wait around 6 weeks before getting behind the wheel again. Once again, listen to what your physiotherapist advises. This goes for returning to work too. Obviously, if you have a desk job, you’ll be able to go back sooner than if your job involves you bending often and getting down on your knees. If you play sports, it’s crucial that you don’t resume your chosen activities until your physiotherapist has given you the all clear. This will vary from person to person but, on average, apart from the exercises you have been given to do, you should avoid all sport for around 6 months and, if it’s a contact sport such as football, rugby or hockey, for example, do not expect to play for around 10 months.